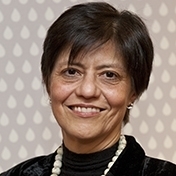 Ms. Blanca Jimenez Cisneros was born in Mexico and holds a Degree on Environmental Engineering specialized in water from the Universidad Autonoma Metropolitana; a Master´s and a Doctorate (Water and Wastewater Treatment) from the Institut National des Sciences Appliquees (INSA) in Toulouse, France. Among her most outstanding positions, she has been President of the International Water Association in Mexico; Vice President of the Mexican Academy of Sciences; Professional Development Coordinator at the Mexican Institute of Water Technology (IMTA); Deputy Director of Hydraulic and Environmental Engineering Institute of National Autonomous University of Mexico (UNAM); President of the College of Environmental Engineers of Mexico and the Mexican National Engineering and Environmental Sciences. At the international level, Ms. Jimenez Cisneros was a Senior Expert Consultant to the Governments of Argentina, Ecuador, Guatemala, India, Mexico, Nicaragua, Spain and South Africa in wide range of issues including the formation of national wastewater treatment programmes, water re-use; as well as co-Chair of the Inter-American Network of Academic Sciences and member of the Executive Committee of the International Water Association. She has closely collaborated with IHP initiatives in our region, especially with those related with urban waters, area that she has a clear commitment and with Aqua-LAC Scientific Journal, both as author of published articles and as a reviewer. She has received several awards, the most remarkable being the Global Water Award of the International Water Association (2010); the National Prize of Sciences and Arts in Engineering (2009); the Award of the National University in Technological Innovation (2008); Nobel Peace Prize for her participation in the 4th IPCC Report on climate change (2007); National Environmental Merit Award (2006) and The Royal Order of the Polar Star (2002) delivered by His Majesty Carl XVI Gustaf, King of Sweden.